- In other words, the great challenge. 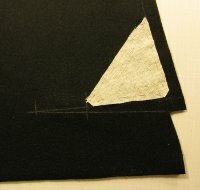 I have hardly any education or experience about tailoring or pattern drafting for men in general. 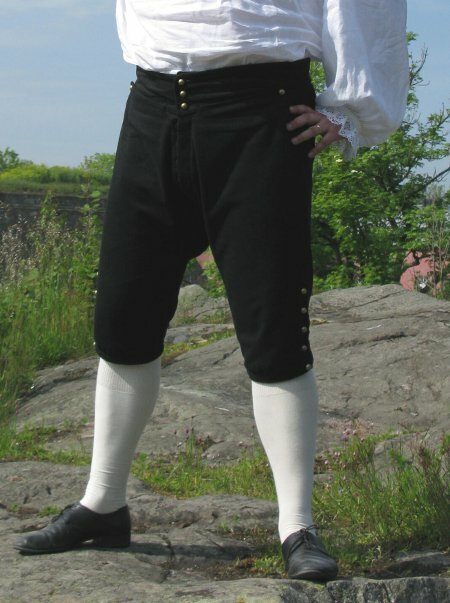 On the other hand, historical fashion needs a different kind of approach to cut and fitting anyway. When I began this project, I was still developing my eye for the period look, as I still am, of course. Nor did I have a very clear idea about the construction. As for the patterns, there are of course patterns taken from museum pieces, but unfortunately all I came across were not even close to Jarno's size, which makes getting the proportions right a bit more challenging. Once again I was greatly aided by La Couturiere Parisienne's tutorial and also received some advice for friends. The rest I reasoned by myself, probably not always with the best results, but then I can always claim that this is my first one, right? When the suit was finally finished I was actually a bit bewildered that I had ever managed to finish it at all. 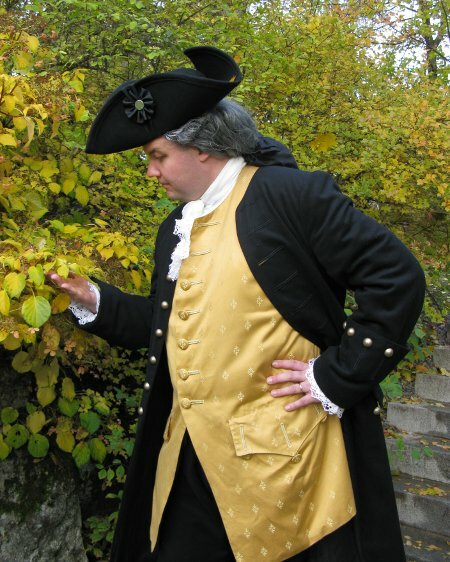 Dating the suit loosely about mid 18th century was first and foremost based on aesthetics, as I'm rather fond of the look. At this point the silhouette had already narrowed a bit from the flamboyant wide skirts and gigantic cuffs of the 40's, but had not yet developed into the slender style of the later century. My own taste runs mainly from the mid-century to 90's, so Jarno's outfit would more or less go with everything I wear - you can always be conservative and wear an earlier style even if your wife goes for for the latest fashion fads. Choosing the material was very easy. Black is always a safe choice, and wool is both period correct and nice to work with. I have to confess, though, that the material I chose (as it was somewhat affordable) has some polyamide too. 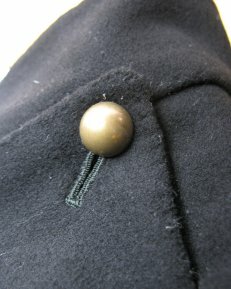 The sole decoration are brass buttons. 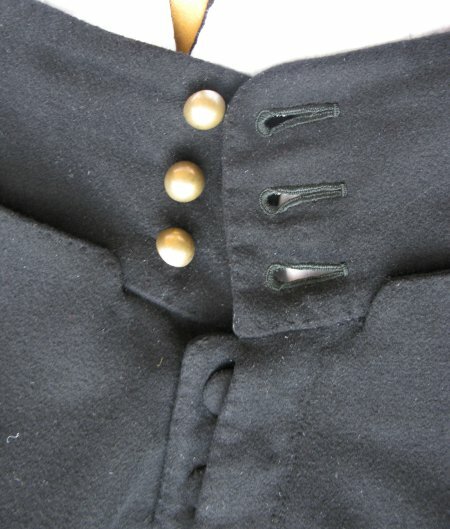 The waiscoat was originally planned to be of the same black material as the coat and breeches, and I was slightly surprised when Jarno declared that he wanted something fancier after all. We didn't have much time to search, so luckily we soon found a nice furnising material which really adds to the look. 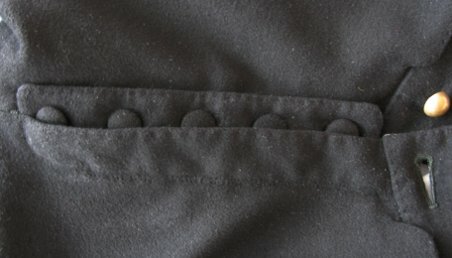 Even though the waistcoat is an important part of the suit, I've chosen to create a page of it's own for it - mainly to prevent this project page becoming impossibly long. 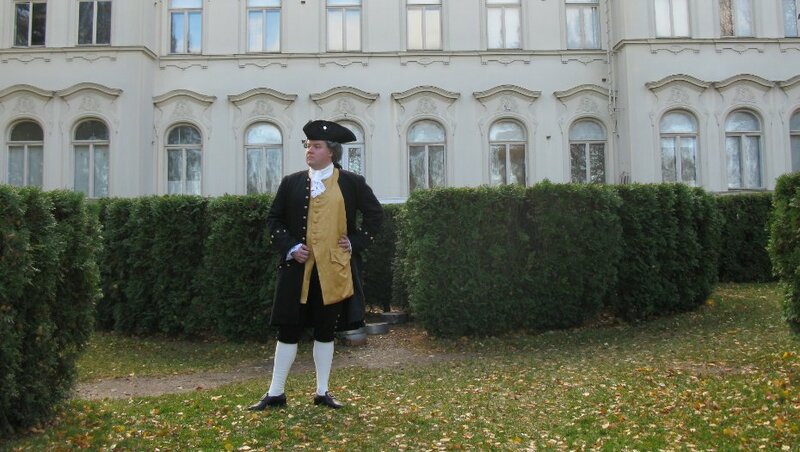 The patterns are a mixture and interpretation of the following sources: La Couturiere Parisienne, Norah Waughs "The cut of Men's Clothes 1600-1900” and the pattern for a mid-century military uniform provided by The Olde Militia of Helsinki. Duran Textiles also had a detailed article about a swedish mid-century suit in their newsletter, which I found very informative. 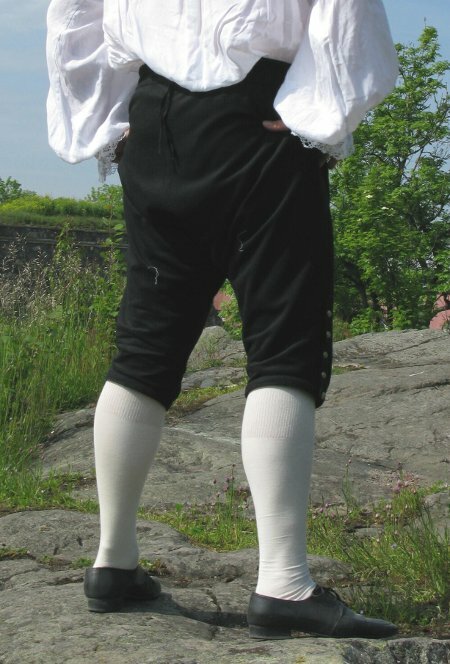 Let us begin with the breeches, with which I begun the project even before I had any idea of the patterns for the rest. It's best to handle such a big project on smaller units if possible. I chose the earlier style for the waist with a fairly modern fly, instead of the later fall-front style. According to Duran Textiles the latter only came in use in Sweden on the 70's, though it was obviously in use in France already in the 50's - exact dating aside, the main reason was that it seemed easier to me. Having made this main style choise I gathered Jarno's measurements and all my pattern sources together and began to draft a pattern. One of my biggest questions was how high the waist was supposed to rise. According to the patterns the waist seemed still to sit quite low at this period, but a little bit higher rise seemed somehow safer to me. Drafting the pattern was very much about trial and error, and if my memory serves me right the third or fourth pair of mock up breeches fit to my satisfaction. Luckily I had bought a lot of muslin from sale! 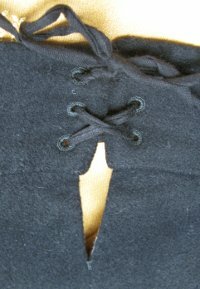 According to some sources, like La Couturiere Parisienne, the breeches were usually left unlined, but as I have seen museum pieces which seem to be lined I decided to make a lining - it so conveniently finishes everything and hides machine stitching and uneven seam allowances (like anyone would care anyway). I used a thin cotton batiste which I use for most things that need a breathing lining. Being totally pedantic I got the great idea to dye it black. My limited dying experiences include mostly pastel tones, but black was quite another thing. After two dyes it was still a very uneven dark blue. In the lining it would do, but then I realized that with sweat or rain the dye just might come off and stain the hand-sewn shirt. I wasn't very eager to take the risk so I bought some more batiste which stayed white. After all the hassle with the patterns the sewing was comparatively easy. The directions for the construction come mainly from La Couturiere Parisienne. 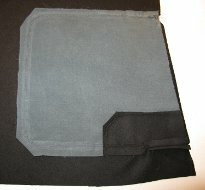 For the interlining in the waistband, and everywhere there would be buttonholes I used linen. Before making the breeches up I stretched the front pieces a bit at the thigh and tried to shrink the back pieces accordingly with steam iron. I made everything I could with machine but all the finishing by hand. On the whim of crazy perfectionism I used the dyed batiste for the pocket bags and the fly, fearing that the white would peek out offensively - which might even have been totally period. 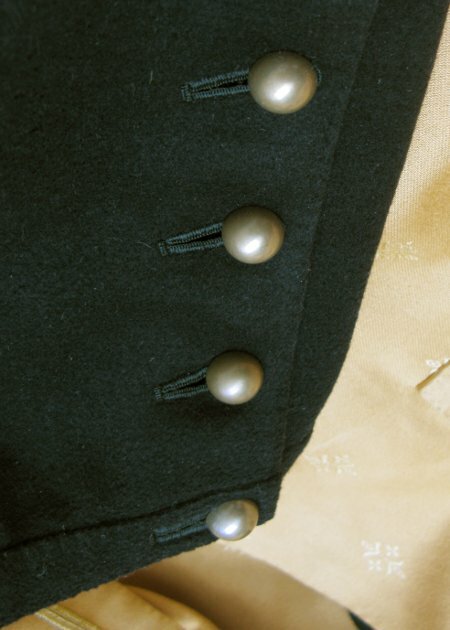 I also used fabric covered buttons for the fly though rest of the buttons were brass ones, so that they wouldn't show. The waistband opens at the back and is closed with a lacing - this gives some room for adjusting the size. The lacing holes are handmade very tightly, which makes them really strong. The kneeband should be fastened with a buckle, but as I was in a hurry I din't bother to search for a suitable one but made a buttonhole instead. Also I realized only after finishing the kneeband how it really should be attached (I hadn't understood the directions properly before), but I'm not going to do it again. All the edges are finished with hand-stitching, which makes them neat and firm. The biggest job were the 20 buttonholes. I used silk buttonhole thread, which was really nice to work with and din't get annoyingly tangled all the time.